A-PDF Image to PDF is a simple, lightning-fast desktop utility program that lets you convert photos, drawings, scans and faxes into Acrobat PDF documents. A-PDF Image to PDF supports most image formats, including images from scanners or digital cameras. Before being converted, the images can be de-skew, rotated, cropped or flipped, etc. Other features include the ability to set the page size, orientation, margin and layout of the output PDF document, change its properties, security setting and viewer options etc. Supporting image acquisition from TWAIN scanners and image acquisition from WIA scanners and cameras. A-PDF Image to PDF provides a very convenient, simple way to create electronic books which can be posted on the Web. You can scan paper documents directly to image files and convert them to PDF. TIF/TIFF, multi-TIFF, JPG/JPEG, JPEG2000(.JP2, .J2K), PSD, PNG, BMP, WBMP, PCX, GIF, DCX, DIB, RLE, TGA, PBM, PGM, PPM, ICO, PCD, WMF, EMF, CUR etc. You can rearrange, sort or delete page from the scanned pages you wish; Add new scanned pages to an existing TIFF file. 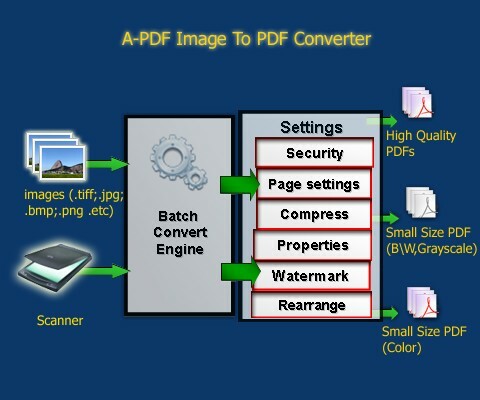 A-PDF Image to PDF can Batch Process Scanned images before you convert them to PDF file, include: Batch Cut scanned pages (Vertical or Horizontal); Batch De-Skew scanned file; Batch Crop and Rotate Scanned Images. A-PDF Image to PDF can convert a folder of images files to PDF, batch convert each folder into individual PDF file. You can merge several image files into a single PDF file, or convert each image file into a separate PDF file. Build to one PDF file. Build to one PDF file and email. Build to one PDF file and send to Ftp Server. Build to multi-PDFs for each images. Build to one PDF file and merge to an existing PDF. Build selected images\scanned pages to one PDF file. Build to multi-page TIFF files. High Quality Output: A-PDF Image to PDF creates PDF from images (Scanner) with high printing resolution. Small File Size (Color): It will compress the images by resizing and reducing the JPEG quality for color images in output PDF. Small File Size (Monochrome): It will convert images to monochrome(black and white only) and resize them to reduce the output PDF file size. The option is great for scanned text images. Small File Size (Grayscale): The option is similar to Small File Size (Color) except the output PDF file will be grayscale. You can preview and process the images before converting. A-PDF Image to PDF can output all of image into one PDF file or multiple PDF files. Even email the PDF file generated directly. Size, such as A4, Letter, Image size, Custom etc. Orientation, includes Portrait and Landscape. Page layout. You can set images number per page, for example, 4 images in one page. Image position, include Fit and Stretch. You can set output PDF file's properties (includes author/title/subject/keywords), password security and viewer options. You can add watermark to the final PDF file also. A-PDF Image to PDF can ftp transfers or e-mail your PDF directly. It can also create bookmark using the adding image files name. You can build a batch of image to multiple PDFs, one image per one PDF file. And you can email the built PDF file directly, instead of saving it firstly. 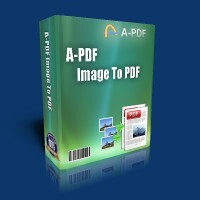 A-PDF Image to PDF is a standalone program costing only $35. It does NOT require Adobe Acrobat Pro, which costs hundreds of dollars. Want more powerful program? Let us do a special one for you.